The concept of “money changing hands” has changed dramatically over the past twenty years or so. Depending on your age now, doing your banking when you were younger may have waiting for your local bank branch to open and lining up to deposit or withdraw cash. If you were born in the seventies then your first memory of banking might be those “holes in the wall” – ATMs were introduced to New Zealand in the eighties, hence eliminating the stress of needing to get to the bank before it closed! Perhaps a more significant introduction though was the first credit card – Bankcard – which arrived in New Zealand in 1979. Over the succeeding years the popularity of putting things on the plastic has boomed; According to the Reserve Bank of New Zealand (RBNZ), at the end of June we owed approximately $6.48 on our credit cards. We put plenty of stuff on debit cards too. In fact overall, according to Statistics New Zealand, the total number of retail electronic card transactions in New Zealand average well over 100 million per month. That’s the number of transactions (including both credit and debit) not the value. In fact that volume of transactions represents approximately 28 electronic transactions per New Zealand person aged 15 and older. Despite all this electronic enthusiasm cash is still an important part of our transaction lives too – and it recently became brighter! In late 2014 the Reserve Bank of New Zealand (RBNZ) announced changes to our banknotes in order to take advantage of technological advances in security features. Those changes have now been put in place. If you haven’t noticed the new notes in circulation yet, you can check them out here. 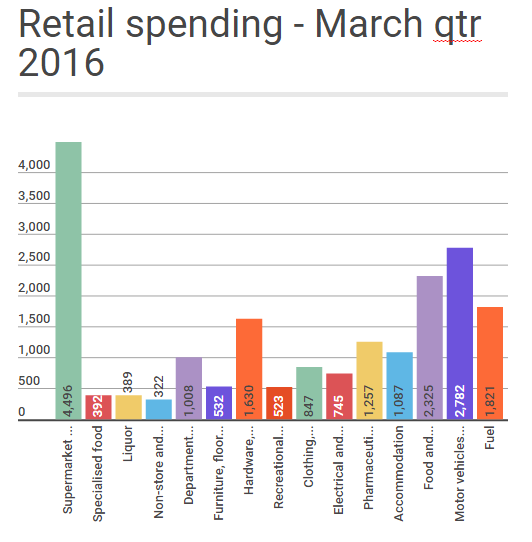 That’s how we spend money – but what do we spend it on? Each quarter Statistics New Zealand releases details of where our hard-earned dollars go. Not surprisingly, supermarket and grocery stores take a big chunk of our money, as does hardware, building and garden supplies (we seem to be house-proud) and other food and beverage. Overall we spends more than $20 billion on retail per quarter!